The programs built by you create real change in communities, just ask those who are impacted! 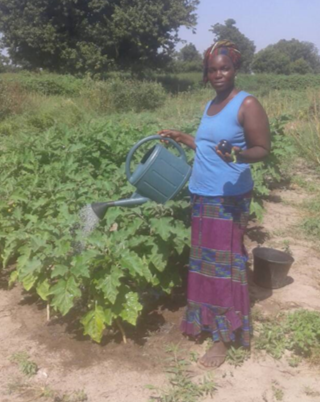 Aida Niang has been working in the Sama Toucouleur Garden for the past couple years. She has benefitted from a boost in income, and her family has received a huge rise in their nutritional options at home. “Andando has changed my life, my status, and my profession. With Andando, I became an entrepreneurial woman. I had previously had no economic occupation, I always stayed at home without doing anything and I had much difficulty supporting my family, my husband and my children. “Now, all the women of Sama Toucouleur feel the happiness in their faces, because Andando has brought change on the social, health, educational and agricultural level. “In terms of health, Andando has made a health post at Sama Toucouleur allowing women to receive medical services before and during pregnancy, in delivery, and even after. Then, we bring our children when they are suffering from any disease, because treatment and medical visits are done without difficulty. “They also work for the education of our kids, and Andando supports our schools by building classes. Further, with the children getting breakfast every day at school, this helps parents save and their children to thrive. We have made some incredible impacts this year, and yet the needs are vast. People like Aida Niang are ready to take them head-on, they just need a little investment and encouragement on our part. Newer Post"We Are More Engaged and Ready to Take Action!" Older PostThank You For This Brilliant Gift!